A recent study showed that the frequency of an antiretroviral factor TRIM5 gene-derived isoform, TRIMCyp, in cynomolgus macaques (Macaca fascicularis) varies widely according to the particular habitat examined. However, whether the findings actually reflect the prevalence of TRIMCyp in wild cynomolgus macaques is still uncertain because the previous data were obtained with captive monkeys in breeding and rearing facilities. Here, we characterized the TRIM5 gene in cynomolgus macaques captured in the wild, and found that the frequency of the TRIMCyp allele was comparable to those in captive monkeys. This suggests that the previous results with captive monkeys do indeed reflect the natural allele frequency and that breeding and rearing facilities may not affect the frequency of TRIM5 alleles. 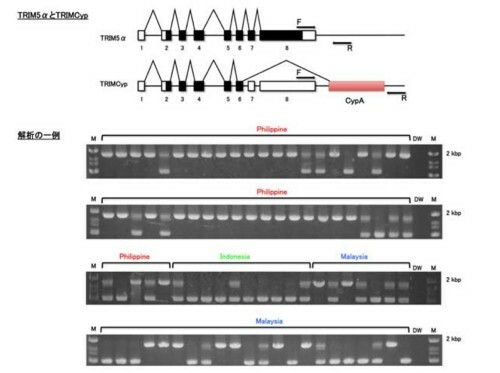 Interestingly, the prevalence of a minor haplotype of TRIMCyp in wild macaques from the Philippines was significantly lower than in captive ones, suggesting that it is advantageous for wild monkeys to possess the major haplotype of TRIMCyp. Overall, our results add to our understanding of the geographic and genetic prevalence of cynomolgus macaque TRIMCyp.